With five days to go before a possible strike occurs, salary raises are the biggest item on the table during this round of negotiations, with many in the union — which includes both teachers and other school employees, like paraeducators — calling for wages to increase by 15 percent. Negotiations between the school district and the teachers union failed to produce a contract Wednesday, bringing Seattle Public Schools one day closer to the brink of a potential strike. 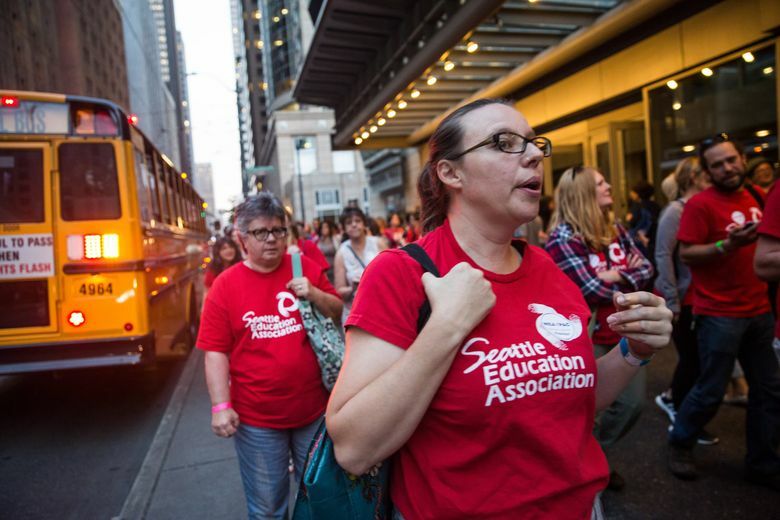 The district and the Seattle Education Association union have met about 22 times since May to work out the terms of a new contract. Despite missing the Aug. 25 deadline for a contract, which triggered the union’s Tuesday evening vote to authorize a strike, both parties reported Wednesday that negotiations are proceeding in good faith. “The district is hearing us a little clearer now,” said Phyllis Campano, president of the Seattle Education Association, the union that represents 6,000 of Seattle’s public school employees. “We’re hopeful” that the negotiations will be wrapped up by the end of the weekend, she added. The biggest sticking point in this round of negotiations is teacher pay. Many in the union — which includes both teachers and other school employees, like para-educators — are calling for their wages to increase by at least 15 percent. Bolstering their request is the handful of districts such as Edmonds and Bellevue that have awarded their teachers with double-digit increases during this hectic collective bargaining season. On Tuesday, members of the union’s negotiating team said the district has been drawing up models of salary schedules to represent various levels of pay increases, but hasn’t yet made any formal offer. It might be taking longer than expected because this time around, the parties are using something called interest-based bargaining, a less-adversarial process where they work together to come up with a contract. Kate Eads, a member of the SEA negotiating team and a teacher-librarian at Northgate Elementary School, said that early mockups from the district included different pay-raise percentages for teachers and classified employees, an idea the union has rejected since negotiations leading up to the last teachers strike in Seattle, in 2015. Seattle Public Schools officials and bargaining team members haven’t released many details about the bargaining process, citing legal reasons. But during a visit to The Seattle Times in July, district leadership foreshadowed a tense month of negotiations ahead. Deputy Superintendent Stephen Nielsen had noted that teachers would be mistaken to count on an 18 percent raise. In addition to an updated pay package, equity issues could make it into this year’s contract, according to Marquita Prinzing, director of SEA’s Center for Race & Equity. So far, the negotiators have considered creating a new mentoring program aimed at educators of color, more consistent implicit bias training for interviewers and more racial equity teams for school buildings. Close to half of Seattle Public Schools, around 40, have racial equity teams, which comprise teachers, parents and other school employees who work on changing practices in schools to improve achievement for students of color. Negotiators have also discussed including more accessible health care for substitute teachers and professional development for para-educators. The most recent contract for teachers and classified staff, created in the aftermath of the five-day strike in 2015, included pay increases of 9.5 percent over three years and a cost-of-living adjustment of 4.8 percent over two years. It also guaranteed 30 minutes of recess daily for elementary students, added teacher pay for a longer school day and lowered special-education student-teacher ratios. 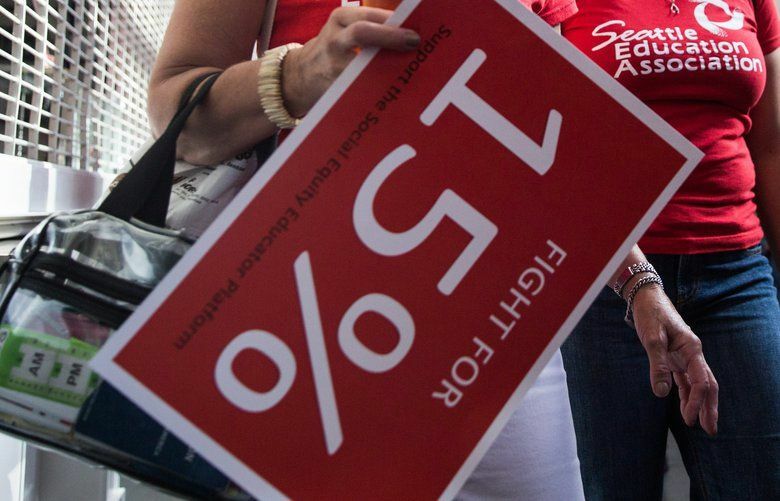 Under their current contract, Seattle teachers earn between $50,600 and $100,800 before taxes. Neighboring districts already have struck deals with their teachers unions to provide salaries ranging from $53,000 to $111,100 in Bellevue; $55,900 to $113,000 in Lake Washington; and $62,100 to $120,200 in Shoreline. Meanwhile, teachers in four Clark County districts — Battle Ground, Hockinson, Ridgefield and Vancouver — went on strike this week. Despite the 2015 raise for Seattle Public Schools teachers, many educators and school employees argued that their salaries were still not enough to keep up with their workloads and the skyrocketing cost of living here. Like many others working in Seattle, they’ve resorted to side gigs and long commutes from the suburbs to make it work. Melissa Nguyen, an accounting specialist who has worked at the district for two years, said she commutes to work from Sammamish in the early hours of the morning. Cindy Vielbig, a kindergarten teacher at Stevens Elementary School, said she worked summers and breaks at a catering company and drove for Lyft and Uber to make ends meet. It was only after she put one of two bedrooms in her Ballard apartment on AirBnb that the 57-year-old was able to save up for a home in White Center. Sometimes Vielbig’s schedule at work, which she said averages about 10 hours day, would get so hectic that she’d call her brother to flip the room before another guest arrived. Across the city on Wednesday, teachers picketed in front of schools. Campano said bargaining will resume at 8:30 a.m. Thursday. Seattle Times staff reporters Paige Cornwell and Neal Morton contributed to this story.